- Our company was established about ten years ago to improve the ecological situation in Absheron, and is a regular participant in the Caspian Ecology exhibition. 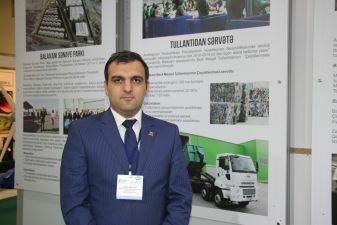 We firmly believe that this useful exhibition needs some substantial promotion, because it is important for the development of "green economy" in Azerbaijan. "Tamiz Shahar" is engaged in the disposal and recycling of municipal solid waste. On the balance sheet of the company there is a plant built using German technology. Each year, the company receives 200 thousand tons of such waste, and segregates them by type (plastic, glass, paper, etc.). We also operate a plant for the incineration of municipal solid wastes (the capacity is 500 thousand tons per year), while also generating electrical power (231 million kW / hour), of which 15% is used to cover the internal needs of our enterprise and the rest is transmitted to the power grid, which allows 100 thousand families to be provided with electricity. Our company also owns a landfill for the disposal of solid household wastes, the gas released during recycling is converted into electricity to cover the needs of the landfill itself. In Khazar district, we are implementing the Tamiz Gala project, under which primary waste is sorted into organic and inorganic. In the village of Gala, we opened a museum called “From Waste to Art”, in which works by masters from many countries have been exhibited since 2012. Here in the lobby, we have displayed 20 works made from various wastes. Our company also contributes to the work of the Balakhani Industrial Park, in which resident companies are engaged in the processing of solid household wastes and the production of various products.